EU, we have a problem – but you hit the wrong targets! Yes, we have problem with gun crime. Yes, they ordered unregistered converted firearms by internet. No, these firearms did not belong to authorised owners. No, they ordered illegally reconverted firearms via the darknet. EC wants confiscation of authorised firearms and more. 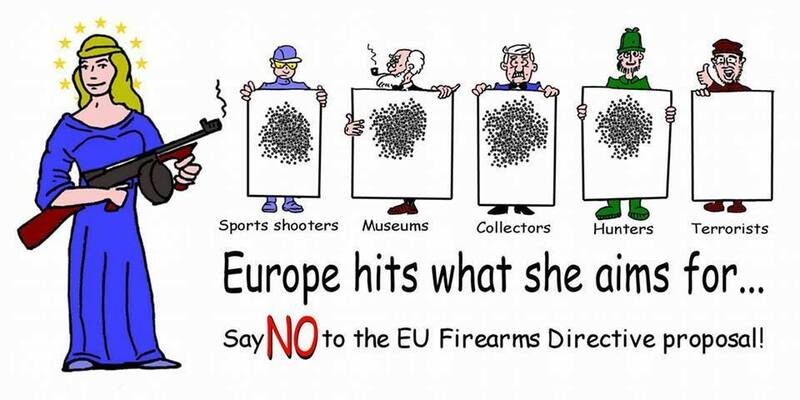 And SIGN our petition: EU : You cannot stop terrorism by restricting legal gun ownership. Article in French: Union Européenne, NOUS AVONS UN PROBLEME – MAIS VOUS AVEZ ATTEINT LES MAUVAISES CIBLES ! Article in German and as PDF: EU, WIR HABEN EIN PROBLEM – ABER IHR TREFFT DIE FALSCHEN ZIELE! Article in Italian: CARA UE, ABBIAMO UN PROBLEMA – MA TU MIRI AI BERSAGLI SBAGLIATI!! Article in Spanish: EU, TENEMOS UN PROBLEMA – ¡PERO ESTÁS IMPACTANDO EL OBJETIVO EQUIVOCADO! Article in Polish: UNIO EUROPEJSKA, MAMY PROBLEM — ALE OBRAŁAŚ NIEWŁAŚCIWE CELE! Article in Czech: EU, máme problém – ale vy jste zasáhli špatný cíl! If a legally held firearm get misused it is for suicides and interpersonal violence. In both cases the legal possession of a firearm has only an impact on the chosen tool, not on the action itself. Legal ownership of firearms does not increase the suicide or homicide rate in total; in fact there is no correlation at all between violence and legally held firearms. This week the European Investigative Collaborations (EIC) published breaking news about the firearms misused by terrorist. These are the weapons from state arsenals, which are poorly guarded – and risk burglary. ..But throughout the region a larger stockpile is likely to be in private hands, and hiding in basements: when Albanians toppled their government in 1997, at least 500,000 weapons were stolen during the riots and more than 1.5 billion rounds of ammunition. Today there is a flourishing business selling and buying such weapons, even at flea markets, and they are sent to west Europe using buses and private cars with no verification on their contents. The customs officers stand no chance, while others take bribes, as a TV investigation published by Canal Plus has shown recently. are not shipped by post. get smuggled in, hidden in cars. At a routine check on his vehicle at the ferryport of Rodby, investigators discover ten hand grenades and 13 weapons. His car is an arms depot…. The car driven by the ex-cop has 25 hand grenades and four assault rifles under the brand Zastava M 70, the Serbian Kalashnikov. Police call this “ant trade“: numerous shipments of small numbers of weapons that, over time, result in the accumulation of large numbers of illicit weapons by unauthorized end users. as de-activated into blank-firing weapons, called salut or acoustic weapons. These firearms had been manufactured many years ago for use by military and police forces but which were sold legally by governments as surplus. They were then converted to blank-firing firearms using inadequate technical specifications. The ‘acoustic’ firearms converted by the Slovak company could therefore be reconverted to live firing firearms using simple techniques and tools. Contrary to what has been stated by Police officials in Brussels, these firearms should have remained under the scope of the Directive and subject to authorisation. In spite of this they were sold without any paperwork and were hence untraceable. Unlicensed technicians with a basic knowledge of gunsmith techniques would be able to reconvert such firearms within a couple of hours. Persons with ordinary knowledge of metal workmanship would need five to six hours. However it must also be said that persons with medium-high knowledge of gunsmith techniques can build an entirely new firearm out of raw steel – one may observe this in Pakistan and the Philippines. It is just a question of the time one takes. The same applies to the preparation of explosives. In other words, persons with a criminal or terrorist intent will always find ways and means to procure their weapons. A Slovak company (AFG) offered such acoustic firearms for sale on their internet site and sold 14,000 units in the last five years. The British and German police sent cyber-investigators to buy such weapons. The tracking numbers of emails led to the Bavarian town of Schweinfurt, and to a 20 year-old student Christoph K. In January 2015 the cops raided his campus flat and other arrests were made in Europe. Christoph K. was re-activating weapons bought from AFG in his basement and selling them on at a profit of ten times. He received four years and three months in jail. In 2014, AFG serves a man from north France over the internet – Claude Hermant. ..After the Paris terror attacks in January 2015, police raided his workshop and found weapons, all reactivated either by drills or by replacing the barrel. But Hermant had an excuse. The story he told investigators was that, since 2014, he had been buying weapons with the knowledge of the French Gendarmerie, to document an arms dealing ring. According to the research by EIC journalists Hermant ordered the VZ 58 from AFG which which Coulibaly killed at the kosher supermarket in Paris. So the French Government did the same as the US Government did in its “Fast and Furious” project. They sold indirectly firearms to criminals, lost tracking and supported with this action the killing of several people. The European Commission did not find it necessary to enforce the Directive as it was then (and is now). Now we hear that this was a conscious decision in order to be able to hold tabs on would-be terrorists. And France even blames the gun-sellers lobby and wants to punish everyone for the failure of the Commission. We definitely have a problem with deactivated and converted firearms sold via the internet and shipped by post. Nobody can trace these firearms, nobody checks the consignee or the seller. The only reason this has happened is because the current EU Firearms Directive has not been enforced by the EC and these firearms which should otherwise be subject to authorisation have been sold licence-free. However we do not have a problem with firearms of categories A, B, C and D that are registered and which when they are to be transferred between two persons resident in different Member States require prior authorisation by the authorities in both these States. Such firearms are recorded in national databases and will never be converted or transferred to third parties without a permit from the authorities. In 2014, AFG began to be of interest to authorities in Germany and the UK. A starting point was a parcel from Germany, destined for a British gangster Alexander M., aka Smokey, a robber from London who now serves a life sentence. The parcel contained the submachine guns type VZ61, known as Skorpion. Smokey ordered the guns from prison, using his smartphone. The authorities only had a pseudonym for the German intermediary who trafficked the weapons – the name Max Mustermann – on a dark net commercial website called Agora. Comments on the site ‘reviewing’ Mustermann read: “My first choice” and “Max is the best”. The problem of inadequate technical guidelines for the conversion of firearms to blank firing acoustic firearms and for the deactivation of firearms has been known since the first report of 2000. The issue was mentioned again in the next reports of 2010 and 2012. But the EC waited until 2013 in order to commission a study which was published with an impact assessment on deactivated, blank firing and acoustic weapons in summer 2014. Promoting the improvement of statistics and knowledge sharing. These findings were also recommended by the Evaluation of December 2014 as legislative action of medium priority. The same study concluded that it was required to ease procedures for the movement of registered firearms. It also mentioned possible problems in the near future regarding internet sales, conversion of semi-automatic firearms and 3D-printers. The study thus recommended that data on these three topics should be collected for analysis. There is no correlation between the legal trade, ownership and use of licenced firearms and terrorism and crime involving firearms. Crime and terrorism are dependent on source that provide of illegal firearms. The EC proposal hits legal trade and ownership of licenced firearms. However it fails to propose tangible and credible measures against illicit trafficking and illicit conversion. Finally the EC ignores the proven fact that what is missing is serious enforcement of the Directive to tackle these criminal offenses.